On June 25, FNC voted to approve the donation of $5,000 to the BF Day PTSA, for the BF Day Playground Improvement Project, in support of PTSA’s grant proposal to the King County Youth Sports Facilities Grant Fund. On May 21 the Fremont Neighborhood Council board had unanimously voted to donate the money, but all expenditures that large require a formal vote one month after initial proposal. The B.F. Day exterior grounds are in dire need of an upgrade. The existing playground has not been improved for over 30 years and is mostly impervious asphalt. The new plan’s renovations provide opportunities for safe appropriate play for children ages 5-12. 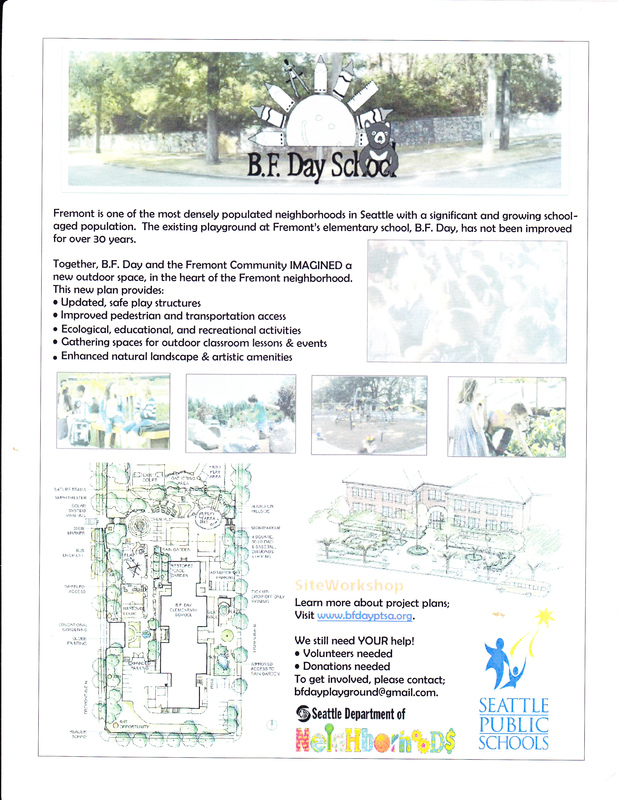 The FNC board supports this project because improvements to B.F. Day’s grounds will benefit the families and staff at BF Day and the surrounding Fremont community. Final approval of large donations requires initial action one meeting prior to a final vote to authorize the spending. The vote is scheduled for June 25, 2012, FNC’s next board meeting. The mission of the Fremont Neighborhood Council is to promote and support the interests of Fremont residents, including the physical and social betterment of the neighborhood. FNC encourages the participation of Fremont residents in decisions affecting their neighborhood and urges support of this worthwhile community project.